I have written a basic & simple GUI calculator in python using Tkinter module. Since Tkinter is cross-platform so it works on both windows and Linux. If you are a beginner, and want to learn some basic GUI with python, this will be helpful for you. In order to run the program on ubuntu/linux you must have Tkinter module installed. in windows, You don't need to install Tkinter as it comes with the default python installation. Install Tkinter by entering this command. 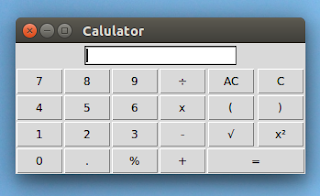 When any number (0,1,2...) or operator (+,-,*,/,%) button is pressed, its value is passed to the action function, where the value is simply inserted into the text box of the calculator. and when the '=' button is pressed the equal function is called, where the expression in text box is stored in a variable expression and the result is calculated using the eval function. The square, square root, modulus function work similarly to the equal function, the only difference being it uses math functions to calculate square,square root... after evaluating the expression. Before doing the evaluation we replace ÷ with / and x with * in the getandreplace function. we also check if the user has entered the expression in the correct syntax using the 'try-except' block. we create an object of the calc and pass root as master to the init method. mainloop starts an event loop, which is basically an infinite loop waiting for events and respond accordingly. The mainloop can be terminated by closing the window or using the close method. """replace x with * and ÷ with /"""
"""when the equal button is pressed"""
"""when clear button is pressed,clears the text input area"""
"""pressed button's value is inserted into the end of the text area"""